Book Review: “Four Views on the Book of Revelation” (Zondervan Counterpoints Series) | J.W. Wartick -"Always Have a Reason"
Kenneth Gentry, Jr. begins his exposition of preterism with a bold claim: “I am firmly convinced that even an introductory survey of several key passages, figures, and events in John’s majestic prophecy can demonstrate the plausibility of the preterist position” (37). Before diving into this survey, however, Gentry outlines the importance of understanding that Revelation “is a highly figurative book that we cannot approach with… literalism” (38). He defends this claim with a number of points, including the precedent of earlier prophets who used symbolism and the difficulty of consistent literal readings (38-40). Gentry’s case for preterism focuses squarely on the introduction to the book. This is not to suggest that is the only part of his argument, but rather than he himself recognizes the introduction as a central tenant of preterism. He notes the continued refrain of Jesus “coming soon” and argues that this suggests a reading of the text as real prophecies occurring within the lifetimes of those present. Much of the rest of Gentry’s survey is built upon tying the prophecies in Revelation to the historical events of the attack upon Jerusalem. A good representation can be found in tying the “Beast” 666 to Nero and the seven mountains to Rome (67-69). Sam Hamstra, Jr. argues that the core of the idealist view of Revelation is found in a message: “While at this moment the children of God suffer in a world where evil appears to have the upper hand, God is sovereign and Jesus Christ has won the victory” (96). The idealist case centers around seeing Revelation as apocalyptic literature, and interpreting it through that lens (97). However, Revelation is not exclusively apocalyptic but is rather “a mixture of literary styles” (99). The idealist interpretation sees the use of “like” throughout the descriptions of Christ and elsewhere as supportive of the non-literal nature of the book (101ff). Hamstra’s survey of the book of Revelation continues to note what he holds are the symbolic use of symbols and other imagery. Representative is the use of the number seven, which suggests “completeness… the author is speaking of the church at all times and in all places” (102). For the idealist, then, the book of Revelation can have multiple fulfillment throughout time. It is a book which comforts Christians who see the constant wars, plagues, and the like seen in Revelation by reminding them that God is in charge. Ultimately, Pate’s view can be summarized easily: “the best understanding… is that Jesus’ utterances about the Kingdom of God were partially fulfilled at his first coming… but remain forthcoming until his return” (175). C. Marvin Pate’s progressive dispensationalism is grounded in the theme of “already/not yet” (135). This notion hints at eschatological tension which can be found throughout the book of Revelation, according to Pate. That is, there are things which may seem fulfilled “already” but have “not yet” reached their fullest completion. As an example, he notes “with the first coming of Jesus Christ the age to come already dawned, but it is not yet complete; it awaits the Paraousia for its consummation” (136). The notion of already/not yet allows Pate to interpret some texts in a kind of preterist light, while maintaining that they still have yet to find their fullest realization. An example can be found in the letters to the churches in which Pate notes that these are set against the background of Caesar worship while also pointing forward to future events (139ff). Pate’s view is decidedly focused on the millennium and a more literal reading of the texts than the previous two views. The interpretation of Christ’s return is illustrative (166ff). Robert Thomas argues that dispensationalism must be viewed in light of its hermeneutical system, which attempts to remain as literal as possible throughout the itnerpretation of a text (180). Thus, Thomas is an ardent futurist, waiting for the events recorded in Genesis to come about. A major challenge for this view is the interpretation of texts about Christ coming “soon” and “quickly.” Thomas notes that this theme can be grounded in the notion of imminence in which we are to always be ready for Christ’s return as opposed to a notion of immediacy (189). 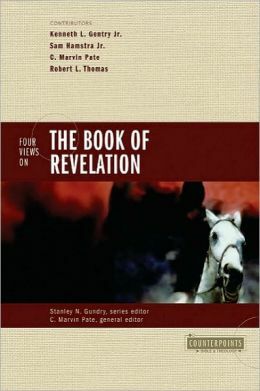 A typical classical dispensationalist reading of Revelation can be found in Thomas’ interpretation of the horsemen. He notes that the first “portrays a rider on a white horse, who represents a growing movement of anti-Christian and false Christian forces at work early in the period… the third… rider on a black horse [represents] famine-inducing forces….” (193-194). Thomas also argues that Israel is not the church and so must have the promises fulfilled to Israel as a nation (196ff). Thomas argues that the major issue is dependent upon which hermeneutical system one employs. If one employs a literal hermeneutic, he contends, one will be dispensational. Period (211-214). I will only briefly comment on each view here. Gentry’s case is quite strong, but I have to wonder about the appeal to the language of “coming soon,” particularly in light of the constant refrain in the Hebrew Scriptures of the day of the Lord being “near.” These prophets clearly did not witness the “day of the Lord” (which, on preterist views is either the 70AD destruction of the Temple or still is yet to come), and so such language has a precedent for longer periods of time than the preterist appeals to. Overall, however, some of the themes Gentry points to does hint at the possibility for interpreting certain prophecies as fulfilled in the destruction of Jerusalem. The idealist position has some draw for me because it focuses on the applicability of the book to all Christians in every time and place. In particular, the idealist interpretation of the letters to the churches is, I think, spot on. It allows for historicity while also noting the fact that we continue to live in an age in which all those types of churches still exist. Yet I can’t help but also note that the idealist interpretation at times seems to play too fast and loose with the text, assuming that certain persons or events are types when it seems more clearly to point to a future fulfillment. Of course, the idealist could respond by saying many of these still are in the future after all. There is great appeal in the notion of the already/not yet aspects of Revelation, which seems to give proper deference to the historical background of the book while also grounding it ultimately in the future promised fulfillment. It is interesting to see that Pate is willing to interpret some aspects of the text figuratively, yet remains convinced that there will be a literal 1000 year reign, among other things. One could charge him with inconsistency here (as Robert Thomas does). I admit Thomas’ view was the most confusing for me. He insists that one must read the text literally, but then says that the white horse is not a white horse with a rider but rather “anti-Christian and false Christian forces.” Frankly, that is not the literal meaning of the text. It is commendable to desire to stay as true to the text’s meaning as possible, but using the word “literal” in this way seems to be abuse of language. But Thomas’ view also has more to recommend it, such as his focus upon the future fulfillment. It is hard to read Revelation and not see many of the events as yet to occur, particularly if one desires to read the text as literally as possible. One thing I must note is that I did experience some great disappointment with the book in that it did not follow the standard format of the Zondervan Counterpoints series. Specifically, the book does not have each author interacting with the others after each view. Although the authors clearly had access to the other essays and were given the opportunity to interact via footnotes throughout their own essay, the level of interaction was not on par with other books in the series. Others have expressed displeasure with the fact that the book does not present the historicist view of Revelation. I share some of that, though I would still maintain that–despite other reviewers [mostly on Amazon] are saying–there are definitely four distinct views presented in this book. They do not cover all the views as comprehensively as some might like, but the views which are included are each unique and worth reading. The quick dismissal of historicism in the introduction may be the consensus of scholarship, but historicism remains a major view among the laity as well as many clergy and some scholars. To have it not included is not the greatest crime, but it does hint at a lack of completeness with the survey here. Overall, I would recommend this book as a way for those interested in Revelation and eschatology more generally to read. It presents four major views of the interpretation of Revelation by giving each author a rather lengthy section to make their case. Readers will be familiarized with the different views, along with arguments for and against each view. Although the book could be improved by the inclusion of the historicist position and greater interaction between the views, Four Views on the Book of Revelation is a worthy read. Let me know what you think. What is your view on Revelation? Book Review: “Understanding End Times Prophecy” by Paul Benware– I review a book on eschatology written from the premillenial dispensationalist position. Source: Four Views on the Book of Revelation edited by C. Marvin Pate (Grand Rapids, MI: Zondervan, 1998). Does the book discuss other books that overlap Revelation? Daniel for example appears to have witnessed John receiving part of Revelation 22 in Daniel 12, while John appears to have heard details in Rev. 22 that Daniel did NOT witness. It gives authority to the 70 weeks of Daniel, and the idea that Revelation’s Tribulation is the 70th week of Daniel’s prophecy. I found that correlation to be key when was I studying it. More recently, as I have been studying the Book of Enoch, and trying to determine what of it is and is not divinely inspired, by comparing it to the scriptures and actual history, I have found a surprising amount of eschatology within it, including some that I perceive to be a Progressive Dispensationalist bent, where Enoch, in writing of the coming Flood, writes of the final judgement of the fallen angels God put into the Pit of Darkness that John writes of as well. This also fascinates me because 1Enoch 1 makes Enoch appear to be the other person Daniel saw on the river in his vision of John’s Revelation. Of course, my current focus is on Creation and I have quite a bit of studying to do before I complete my study (I’m trying to get through Genesis 11, and I am only through Genesis 6:4 to date). However, I have become interested in going back to Revelation again in light of the Book of Enoch to see whether it helps nudge me more in one direction or another. What intrigues me the most is that a great deal of what theologians will spend chapters and chapters saying in order to bring you around to understanding a passage in Revelation, Enoch practically just says. The Pit of Darkness is one example. Also, I had purchased a study on Revelation years ago, and it pointed out that as a narrative, Revelation appears to go back and forth temporally a few times. That really helped in my understanding (of what I grasped at the time). Finally, was there a discussion on how the four views differ on the Mark of the Beast? My reading suggests that it will come during the latter half of the Tribulation, which makes both its timing and form unclear. I ask because Christians often fear receiving the mark unwittingly more than almost any other part of John’s prophecy, and it makes for some pretty pronounced fears (whether justified or not) of modern technology. I pray for you wisdom and understanding in your studies. Thanks for the very thoughtful comment, Mike! The book does discuss Daniel at points. Just looking at the Scripture Index, Daniel is referenced within each view. However, the constraints on the authors by a series like this means that the primary focus is on Revelation, with only passing discussion of any related book. The authors do each discuss 666 as the mark of the beast. Each had a very different notion, of course. I just didn’t want to make my review of the book to be dozens of pages! There is so much to discuss in a book like this it is hard to even touch all the major points. Good review! The problem with the “Four Views” series is that they often have to summarize a lot of information, which can be both good and bad. I’ve actually done more study on eschatology than is normal for our generation 🙂 and thought you did a great job of summarizing what you saw as strengths and weaknesses in each argument. I personally hold to a dispensational view, and from what you summarized above I feel the book did not accurately portray the view. I’d recommend “Understanding End Times Prophecy” by Dr. Paul Benware for a good summary of Dispensationalism and how it fits within the framework of scripture. If you buy it though let me know b/c when it went to print the printers made a typo in a crucial area that I’ll point out to you. Sarah, let me know what the typo is. I have read and reviewed the updated version. I have never been that interested in the “end times.” I purchased this book several years ago only because I thought it would be helpful to have a general understanding of the various interpretations. I found it to be extremely helpful and still refer to it occasionally; it is definitely worth a place on the bookshelf. I also agree with you that the preterist case presented was quite strong, especially for the earlier chapters of Revelation, and that the entry on Classical Dispensationalism was confusing. Any comparative treatment of Revelation that has not given serious consideration to NT scholar William Hendriksen’s “More Than Conquerers”) http://www.amazon.com/dp/0801057922/?tag=bestinclass-20, is seriously flawed IMO. No one of the four views presented is anywhere near as satisfying spiritually, Christologically, nor eschatalogecially as Hendriksen’s “progressive-climactic” cyclicalism. Even the preterest and idealist approaches, which are aware of the extensive symbolism in Revelation, still see all of the “wars, plagues, and the like” as literal. The preterest interprets those as the Roman war against Jerusalem, and the idealist says the reader can be comforted in God’s victory despite all those wars, etc. But the original readers, the seven churches, as described in Rev. 2-3, are not so much needing comfort (about wars, etc. ), but mostly need Christ’s challenge to repent, for they are already too comfortable with various false prophets and messiahs. And the introduction of Revelation–as in 1:1 where John will see what must take place soon–finds its fulfillment not in a second coming or war(s), but in a verse like 2:16 where the church in Pergamum is challenged to repent, or Christ will come soon (to them specifically) and “fight” (war) against them with the “sword” from his mouth. This portrait of Christ is first seen in 1:16 (a sharp two-edged sword comes from his mouth). In Rev. 2-3 this Christ confronts most (five) of the seven churches with their sin and their need to repent (speaking through the true prophet John); in 2:16 he warns them he will come again soon (through John or another prophet) and speak further words of judgment, if they do not repent. So the most clear parts of Revelation (Rev. 1-3) show a “warfare” that is especially heaven’s war(ning) against earth’s churches; and extensive symbolism is used to portray this. Perhaps much of the rest of Revelation reveals heaven’s ongoing warnings against sinful churches, using similar symbolism. And the final judgment is portrayed similarly as the conclusion of those earlier judgments.